Chains. My thoughts and experiences with chains are well documented here on Bikes And Travels. They are a bane in my life yet I have not found a more efficient and easy to diagnose method of power transfer. Easy to diagnose? Ah, well, usually yes but I've been a tad confused with the CB500X this past few months. The chain is very well lubed, much to the despair of the rear wheel which is perpetually bathed in a layer of oil and grease. The tension is regularly monitored and adjusted if required. In use the chain feels fresh. But when I push the bike out of my tin shed or into Sharon's back garden (...stop it...) there's a-clunking from the chain. I swear to goodness it sounds like the front sprocket is severely worn and the chain is "falling" into the worn teeth. There are 2 issues with my theory though. 1. Even when pushing the motorcycle the clunking is too slow. It ought to sound "clunk-clunk-clunk-clunk" rapidly. It's more "clunk... clunk... clunk... clunk". Now perhaps the chain isn't hooking properly on only a few of the teeth? Maybe there's a few bad teeth? 2. I have altered the CB500X's sprocket cover to allow easy inspection of the sprocket AND more importantly easy removal. Looking through my DIY inspection hole I can see the front sprocket is is good order. No bad teeth, no excess wear. Hello Mr Sprocket! You're looking well today. If the chain is a little loose it eases, if it's freshly adjusted it's more pronounced. What the hell is it? I don't like it, I don't like it at all. People complain that my bikes are dirty and rough with questionable DIY attachments and that's fair. But I can't stand thinking that there's something mechanically amiss with them. Chain alignment? I check the markings on the sliders, yeah, they're even. I know these things are "vague guidelines" so I lift the rear of the chain guard to see the top run of the chain. I look along the length and there's no discernible snaking or wandering of the run. I don't have a steel straight edge but this strip of wood is straight enough. Looks good. Let's have a closer look at the front sprocket. Luckily with my specially adapted easy to remove sprocket cover the sprocket cover is, erm, well, easy to remove. The sprocket is fine. Dirty and greasy but the teeth are still teeth. The noise happens less with the bike on the centre stand. But it is still happening, quietly. I touch the front sprocket, trying to feel the noise, trying to see where or what or why it's happening. 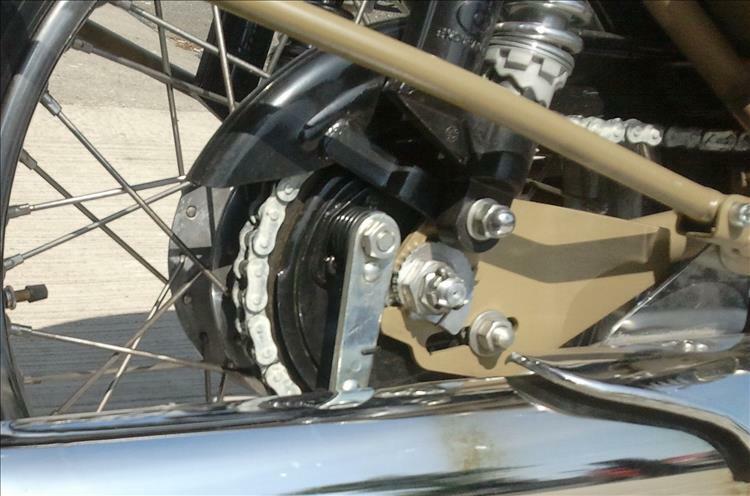 I'm turning the rear wheel with one hand, as soon as I touch the front sprocket with my other hand the noise stops. The big nut tightens the sprocket onto the tapered shaft. On larger motorcycles typically (not always) the output shaft from the gearbox is oh-so-slightly tapered at the point where the front sprocket is fitted. 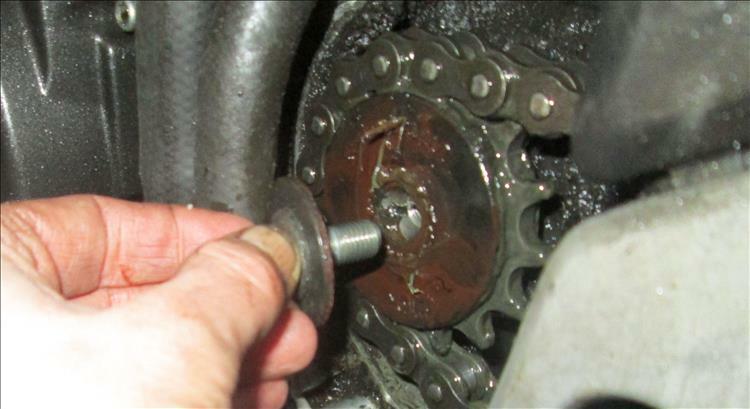 Then a large nut is threaded onto the output shaft is then tightened against the sprocket pushing it onto the taper. This nut is usually very very tight. 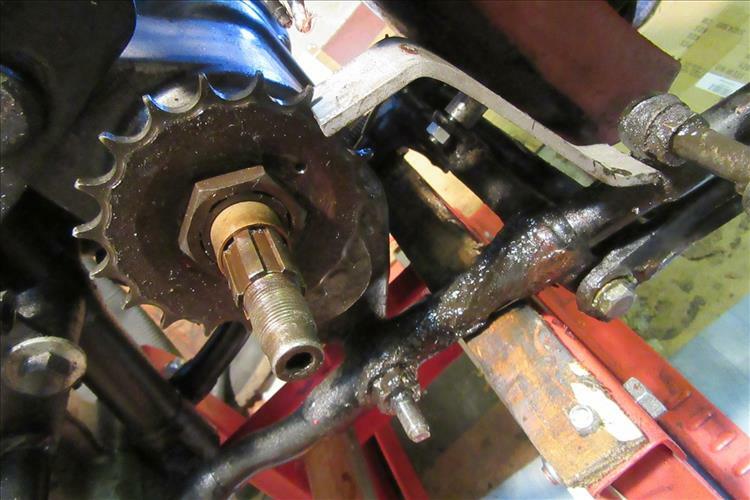 Thus the sprocket is very tightly secured onto the taper of the output shaft. Thus there's very little chance of the sprocket moving at all. This is all fine and dandy until you want to take the sprocket off. Then... then you can have a battle royal getting the super tight nut undone. Then getting the super tight sprocket off. The Fazer had a BIG nut that was tightened to "T.A.F." aka Tight As - ahem. Smaller capacity motorcycle typically (not always) don't have the output shaft tapered. 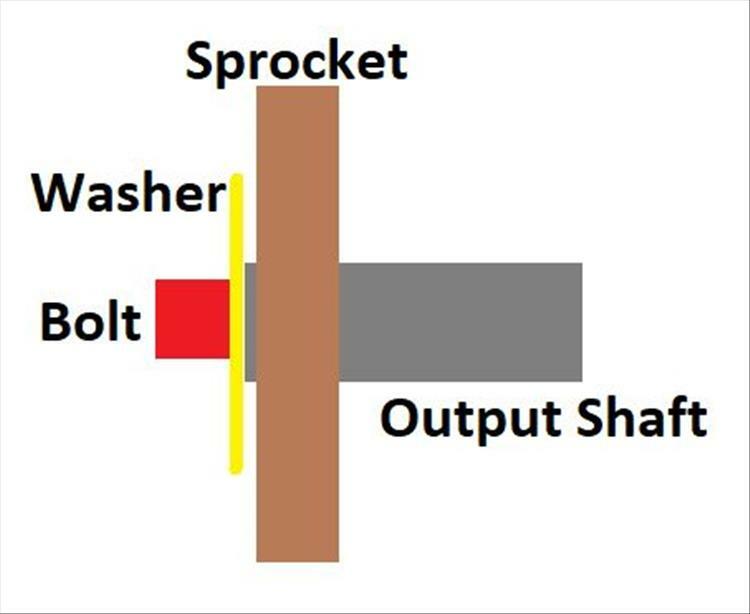 The sprocket pretty much rests on the splines and the nut or bolt that secures the sprocket is there to stop it falling off rather than to secure it firmly against the output shaft. The bolt and washer don't necessarily make contact with the sprocket. This makes sprocket removal very simple. But why not do this on big butch motorcycles? The idea is that having the sprocket fitted loosely to a small bike is fine. 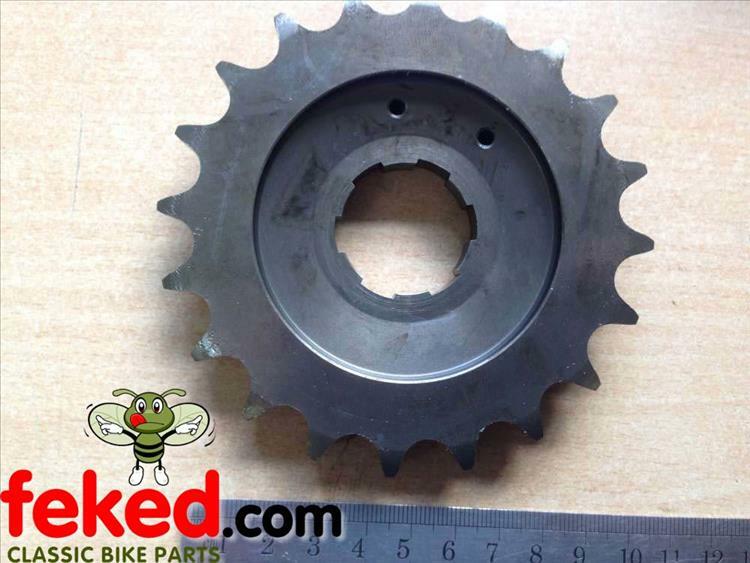 The splines on the output shaft and inside the centre of the sprocket can cope, they're tough enough for a weedy 125. A 120bhp behemoth will be somewhat more brutal on the output shaft and the sprocket. As such a sprocket wobbling on the shaft will suffer a lot of wear. So the sprocket is tightly fitted to the shaft to eliminate any wear at that point. No movement = no wear. What the hell has this got to do with my blinking CB500X?!?! My CB500X does not have a tapered shaft. The sprocket is fitted loosely. Not as loosely as a 125 though. The splines are a (bit) more meaty and the fit is a (bit) closer with tighter tolerances. I guess the 500 is neither a low powered 125 nor a brutal behemoth. I like to think of it as a perfect compromise between the 2. 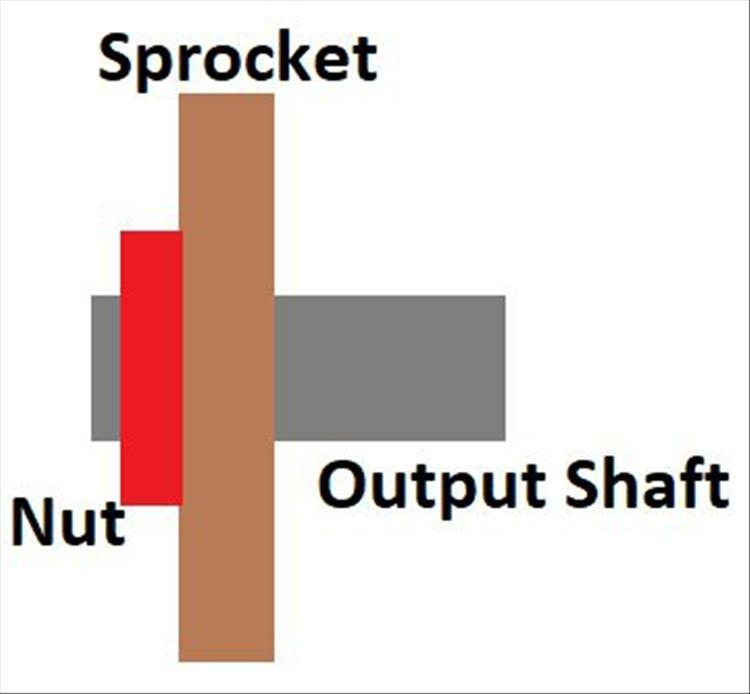 The sprocket is free to move on the splines, the nut is there to stop it falling off. The clunking is the sprocket moving, wobbling on the shaft. While the housing and sprocket outer are swathed in greasy gunky chain lube fling-off the centre is dry, in fact slightly rusty. I remove the sprocket, grease the splines, replace the sprocket, problem solved, noise gone, Ren happy. Slap a bit-o-grease on there. Please note. I'm sure you can all show me examples of 50cc scoots with tapered output shafts and tight nuts. And equally 1300cc bikes with "loosely mounted" sprockets. I welcome your contributions, I'd be interested to see them. I've made some generalisations here so don't assume your motorcycle is set up a particular way. 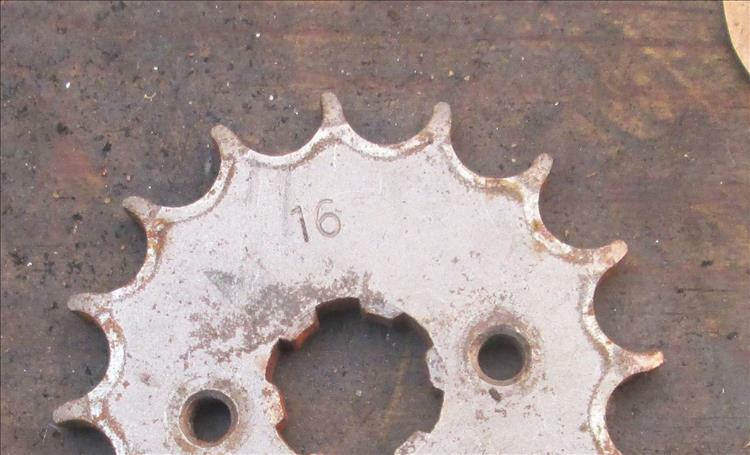 The CBF125's sprocket loosely floats around the splines. Omg is that another job I will have to do. Wait your has done 30k phew I should be ok for a bit. I agree with your opening comments about chains! My chain seems to need attention every time I look at it. All this talk of tapered output shafts and loosely mounted sprockets? I think Upt'North's Pan & Ian Soady's Guzzi has the best system. I am leaning towards the thoughts that my next bike will not have chain drive. My NC700x also has a floating drive sprocket, the only time it gets noisy is when the chain is worn and has tight spots.I have fitted 2 endless chains as it gives me a chance to lube up the swinging arm and suspension linkage. I usually get 20/25k out of a DID VXM chain and have a Tutoro oiler fitted. Its been very much a fit and forget operation but now that i've said that it may all go downhill! Pocketpete - fear not it's not a big job. Rod. Here's a little extra to think about. Chains are the most efficient form of transmission. Shaft drives are less efficient. I'll add a link to a page that *suggests* it could be as high as 25% but others seem to think around 15 to 20% loss of power with a shaft compared to a chain at around 3 to 5%. So that means more fuel being used. Also ensure the marque you are looking at will sell you parts for the bevel and shaft. Back in't day I had an issue with the bevel on my NTV600 Revere. Honda (back then) did not sell the parts you had to buy the whole bevel unit for £1300. It must have changed as I can buy the individual parts from Lings Honda online now. It seems like a lot of work to replace the chain but I suppose you're right, everything can have a clean a lube and a dose of looking at while it's apart. Very thorough. Damn clean too, you obviously have too much time on your hands! I'm guessing Steve is fitting the chain "pre riveted"? 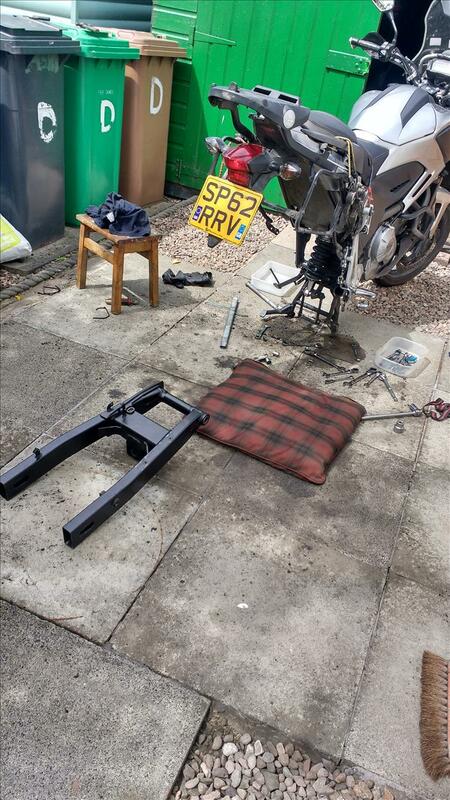 Otherwise as you say Bill there'd be no reason to remove the swingarm. My SLR650's frame ran inside of the chain run so the chain could be changed without splitting the chain at all, same on the CBF125 but that has a split link anyhow. I found with the SLR650 it was a lot lot LOT easier to fit the soft link/rivet link off the bike. The peening of the rivets can be done easily on a sturdy bench vice, it's a faff to do them in situ on the bike. I also believe it is possible to buy a truly "endless" chain, ie one that is already riveted, though you don't see them often. You fitted my chain with a soft rivet link that worked really well. I've had no problems and the little machine I got seemed to work well. You have done 30k now are you on the same chain or have you change it. Both my CBF 250 and CRF 230 the chain runs behind the frame so rivet link for me, spring links not favoured on the CRF 230. as lost a few clips trail riding in the past but always carry two spring links and a few chain links in the tool kit. On the spare spring links the holes are filed so the side plate can be easily pushed on by hand to make it easier on the trail repair but always replaced once back home by rivet link. You are correct Ren I fitted a chain pre rivited. Brooksbarn had an offer a few years ago on DID ZVM gold link (the best) chains at £80 a pop so I bought two,I'm on my second one. I may just rivet the next one. My Himalayan has a spring link and with just 24 bhp i will probably go with the same. As Bill says spring clip links seem to get lost frequently offroad and many guys wire them up as a precaution. Be interested in you 30k chain on the cb500x if it is the original ? I used to ride enduros and trials some time ago on XR's KDX 200/ 250 and ty250 and never had an issue with split links. I was always told to make sure the closed end of the spring clip faced the direction the chain travel. I guess I need to do a post on chains. Steve - I can't specifically recall when I replaced the OEM chain on the CB500X but I have a note on my whiteboard suggesting it was a 17k. Doing the maths and having found my email reciept for a new chain in November '17 that sounds about right. So roughly speaking this current chain has what, 13 or 14k on it now. I reckon this answers Pocketpete's question too. Regarding split links. I have heard stories of failure regarding split or spring links ever since I started riding. In fact before in my bicycling days I heard them on pedal cycles. I guess there MUST surely be some truth and yet I have not personally experienced this issue. All my early bikes were split links and also the 125's I've run these last few years. Talking to Pocketpete this AM he like myself finds the number of differing experiences regarding motorcycling completely bewildering. It's seems there are few things on two wheel (or in life) that are cut and dried, black and white, right and wrong. "I have heard stories of failure regarding split or spring links ever since I started riding. " Ren, Ren, Ian mentioned the B word Ren. I know, I'm a real teachers pet. But if political comments are allowed, if there are no UFO's how do you explain Jeremy Corbin. Like any good parent I'm going to back away quietly. The true art of parenting, knowing when to back away slowly, and knowing when to run like the clappers. Whatever you say can and will be taken down and misinterpreted as evidence against you. I beg to disagree Ren but from the first snap of the sprocket through your peephole (oo, err missus!) I'd say that it was past its scrap-by-day. The valley on the reverse side of each tooth is a lot shallower curve than the drive face and from the photo it looks as though the teeth are starting to hook at the top. As a fr sprocket is under a tenner I'd replace it as a matter of course . . . . DISAGREE!!! How very dare you. OK fair enough. I'm going to claim it's a trick of the light. If you look at the fourth image where I'm replacing the bolt it looks more like it should? Erm. Errr. Erm. Front sprockets are like £15 for the CB500X. Erm. So there. Is there ever a time when you would only one sprocket or should it be the full set in one go. I know when we did my chain the sprockets were like new. Do they gave to be replaced as a pair like my tyres. The standard wisdom is to replace the whole lot, front, rear and chain. 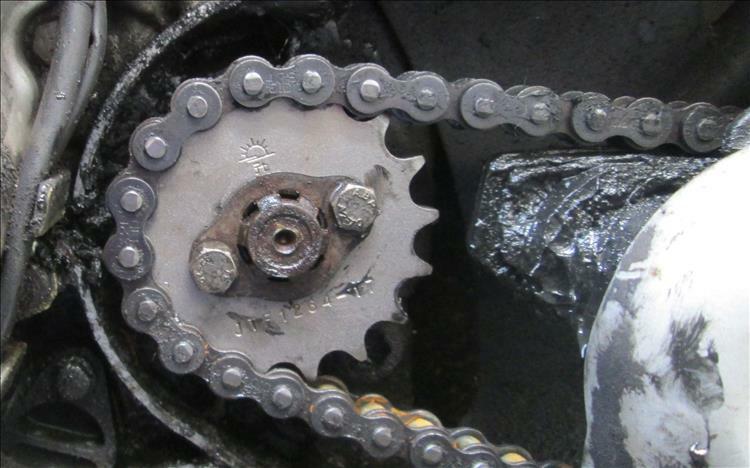 Worn sprockets will stress a new chain making it wear faster than it ought to. I find rear sprockets last longest as they have the most teeth therefore surface area therefore metal to be worn away. On my classics / old clunkers (delete as appropriate) the rear sprockets, which are generally cast iron, wear much more slowly than the fronts. 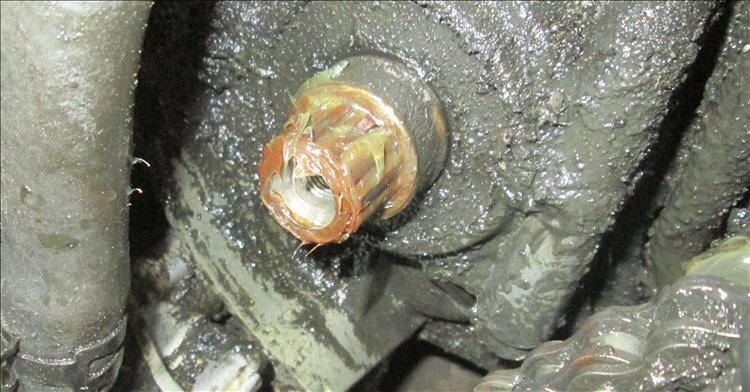 Which is a good job as the rears are generally made in unit with the brake drum so are expensive (if you can get them) and often of very poor quality. Fronts are normally steel which wears faster and as Ren says have fewer teeth. Although I think as well as surface area is the fact that the load on each tooth is less - in my Norton's case around 2:1. OMG OMG OMG!! Yes I learned something truly horrible about the Enfield 500 I've been hankering over this last few years. Oh yeah, simple mechanics, easy access, hydraulic valves etc etc. Then last week I learned that the rear sprocket is part of the brake drum. Whaaaaaaat! You can't fit a new sprocket when the old one wears out, you have to fit a new brake drum with teeth on it. I know it's an old design but if you're going to fit fuel injection you might as well create a bolt-on sprocket surely. Luckily they're not TOO expensive, a quick search on fleabay suggests around £40 to £50. Still, that's a lot more painful than the £20 for the 500X rear sprocket. It just goes to show not everything in the past was better. This all said - just looking on the Enfield site the Bullet 500 is now showing disc rear brake. I suppose it had to be updated for compliance with the ABS regs. There's hope Ren, there is hope. I'm glad you don't "look after" my bikes. That is completely clapped out. When it gets to that state, all the load falls on a few links of the chain making them wear that much faster. .... and this is one I changed on the Norton. It's far better than yours! Nope, don't get it. Why does a worn sprocket put "all the load falls on a few links of the chain"? Shaft drive is looking more and more attractive! Fear not Rod. I am currently working on a water turbine drive system. As you might expect it's not going very well so far but I have to start somewhere. Essentially the water pump pumps water around the engine and radiator. My plan is to run a send and a return pipe to the rear hub from the same circuit, probably just after the radiator has cooled the water. Here a water pump in reverse takes the moving water to turn the back wheel. This is obviously genius as the additional water and pipework improve cooling. No more sprockets. No more chains. No more lube everywhere. At the moment I do have a lot of leaks. I also have to be running at 16,000 rpm to get the rear turbine to rotate at 5 rpm... and that's without the wheel attached. But the idea is sound. I'm sure. Ren, I think that may be over-complicating things to obtain these results. Why not look at placing an electric motor in the rear hub, and powering it with batteries placed in the frame where the engine would traditionally be placed? That is tooooo easy. Obviously! Durgh. On a serious note you'd think that's what electric motorcycle manufacturers would do, but they don't and with good reason. Sprung to unsprung ratio. Electric motors are quite heavy and having a big motor in the wheel would not do much for the handling. It's also a flaw in my water or hydraulic drive design. A big heavy dobbing drive unit capable of handling several hundred bar of pressure will not go down well with my dynamic design team. 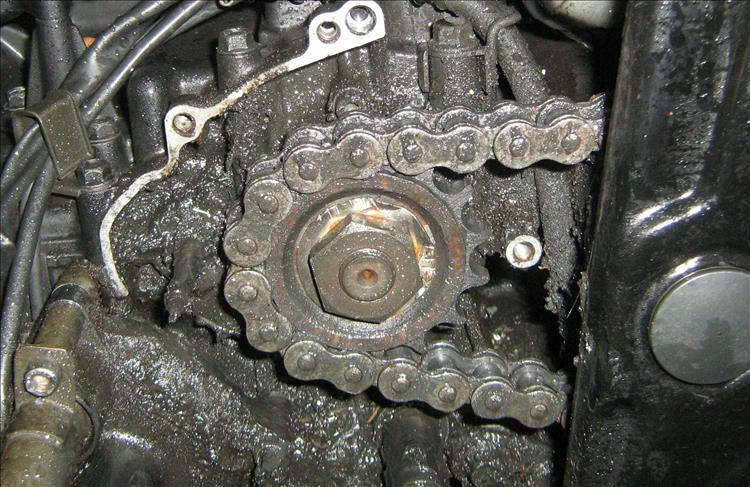 "Why does a worn sprocket put "all the load falls on a few links of the chain"? " Because the effective pitch of the sprocket has increased whereas the pitch of the chain has remained the same. So instead of the load being shared between all the links in contact with the sprocket, it's only the first few that are doing any work. The others are just floating. Try putting a good chain on your scrap sprocket and you'll see. Electric bikes? I quite liked this one. I... I think I'll have to do that Ian because I've still not got my head around it. I've got the old sprocket and the present chain only has about 500 miles on it. An E-Bullet! Mind you 7k and supplying your own donor bike - ooof steep. It is the future though, be it electric or hydrogen or maybe even fusion one day. I will miss the 4 stroke engine in some ways, in others certainly not.